SGM BOD incubators are designed to meet customized requirements of different customers, SGM as an experienced BOD incubator manufacturer in India, produces standard as well as customized BOD incubator models. These BOD Incubators come in various sizes and capacities such from 36 liters to 1000 liters. They are available in different designs for excellent quality performance. These units are made with double walled construction and are fully insulated with polyurethane foam to reduce running costs. The exterior chamber is made of high grade Mild steel with powder coated finish. The internal chamber is made of high grade corrosion resistant stainless steel. 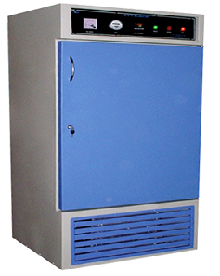 Cooling is most important factor for any incubator. The doors of these BOD incubators are available in Glass or solid doors. To provide proper safety at workplace and to ensure safe use, these units are equipped with various safeties protection devices such as over current protections, leakage breaker and temper proof controls. 1. Providing fast and accurate results. 2. Microprocessor P.I.D. temperature control. 6. Over / Under Counter Design. 7. Spare parts available at stock.